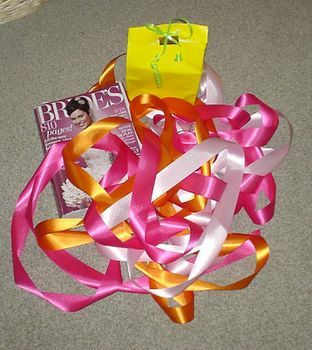 Kat and Karl : Ribbon anyone? my life in a snapshot. ribbons, bridal magazines, and hostess gifts. audra and i spent a couple of hours in hobby lobby looking for ribbon for the girls' dresses and paper stock for the invitations. lots and lots of orange and pink. on a side note(er... more important note! ), our house-to-be inspection was today. It's not great news. Who knew house buying was so stressful? and expensive? It's not awful however. We are thinking it will all be okay. Ok, Karl is thinking it is all going to be okay. I am freaking out. Weekend agenda: Softball game at 9 on Saturday, MY FIRST SHOWER at 3 on Saturday at Renee's, Soccer on Sunday at 6 and who knows what in between. will keep you updated.